Django Django’s Born Under Saturn revels in the beauty of tranquil harmonies as it envelops new art-pop territory for the British quartet. The collection lands mostly in the realm of synthy dance music, but the difference is in Django’s chilling harmonies — think Beach Boys under psychedelic black light. Vocalist Vincent Neff’s smooth, layered tracks and lyrics remind us that while humanity can seem homogenized and oblivious, emotions are still a messy business, and that’s to be celebrated. The band trades in ’80s progressive-tech influences, folding in Jamaican and African rhythms, forming a hybrid sonic tonic that effervesces playfully in the ears. The vintage progressive-synth notes of “Shot Down” are further cultivated on the electric-dance notes of “First Light.” The sultry sax on "Reflections" brings in a jazzy art-rock feel that warms up its space-rock synthesizer. Vegas kitsch kick-starts the percussion sound in “Found You,” while “4000 Years” has a fun, comic-book-rock quality. Slow, swooning piano and drums color the hometown sound of “Beginning to Fade.” On “Break the Glass,” a surprising xylophone follows an upbeat guitar strum, creating one of the album’s strongest dance numbers. 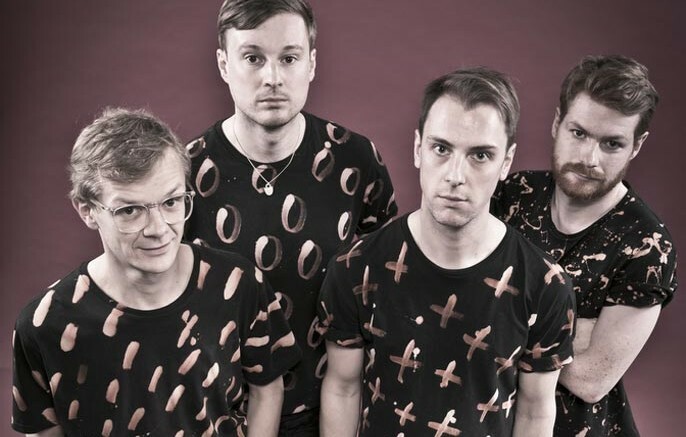 The scorching, slow build of Born Under Saturn establishes Django Django as synth-funk grand experimenters and is an example of how to claim new territory in the current landscape of indecisive subgenres.